Gretchen Harris, UCMVA's "Female Vocalist of the Year", is a Catholic singer/songwriter whose music expresses her love for God and Church. Songs from her seven CDs can be heard on Catholic and Christian radio stations in the United States and many other countries, in addition to the worldwide radio outreach of EWTN. The latest addition to the catalog is "Blessed Are You: Songs You Love to Sing," a CD full of beautiful well-known songs from Mass and beyond, including "Mary, Did You Know," "On Eagles Wings," "You Are Mine" and "I Can Only Imagine." Three very special vocalists sing duets with Gretchen on this album, namely Trevor Thomson, Robert Kochis, and Gretchen's daughter Amy. This mother-daughter duo has delighted audiences by singing together in the U.S., internationally, and on Catholic television. 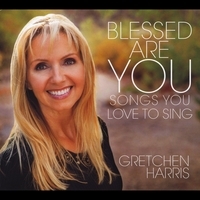 "Blessed Are You: Songs You Love to Sing" is here! Three very special vocalists sing duets with Gretchen on this album, namely Trevor Thomson, Robert Kochis, and Gretchen's daughter Amy.